Mi account unlock tool: Xiaomi users might already be aware that they need to log into their own Mi account when they get their phones. It's very much like the Apple id on iPhones, which controls everything about the smartphone in their ecosystem. It's Xiaomi's way of saying that they are highly invested in their crowdsourced user interface, MiUI. Just like any other thing which involve the username and password, it is possible that you forget the credentials of your Mi account. And again, just like any other thing which requires login credentials, there is a tool which acts as a workaround for getting rid of it. So in this article, we will go through a device which can help you unlock your Mi account and how you can download it for free. Let's get straight to it. What can you do when you forget your Mi account ID and password? A simple way would be to head over to account Xiaomi.com and then enter your phone number to request a reset password. If that does not seem to work for some reason, or maybe you have forgotten your email id altogether, then you can choose to reset the account entirely. That's where our little tool comes into the picture. What is a Mi account unlock tool? Mi account unlock tool as a Mi cloud verification removal tool which helps you to bypass authentication stage of the Mi cloud. This is of great help if you have forgotten your Mi account login ID and password. Narrating from experience, when you change your SIM card or when you change a significant account on your Xiaomi smartphone, it prompts you to re-enter your password a lot of times. And it's incredibly annoying if you have forgotten the password as I have on my mom's phone. This tool helps you to bypass the Mi account or disable Mi account altogether. As mentioned earlier, it helps you easily bypass or entirely remove the Mi cloud verification on your Xiaomi smartphone. It also allows you to create a backup or even restore from the existing backups to your Mi cloud account. You can test your device’s software for robustness and even unlock the account using fast boot methods. The best feature of all is probably the fact that this tool is entirely free for you to download and use for yourself. It is a straightforward tool to, which means that you do not need to be extremely tech-savvy to use it. The Mi account removal tool is very flexible, and it only works on all Windows operating system versions starting from Windows XP all the way to Windows 10. It even includes the extinct Windows Vista; in case you are still somehow using it. So, the bottom line is coming from which you have a decent machine with a verified version of Windows operating system on it; you should be just fine. How to download and install Mi account verification tool? Follow these simple steps to download and install the tool on your system. It is a Zip file. You need to extract it to a location on your PC, somewhere like the desktop. Open the extracted folder and then double click on the exe file in it to install the software. Then, click on the next button and select the appropriate options just as you would install any other software on your Windows system. It's relatively straightforward. At the end of the Setup Wizard, you are presented with a finish button. 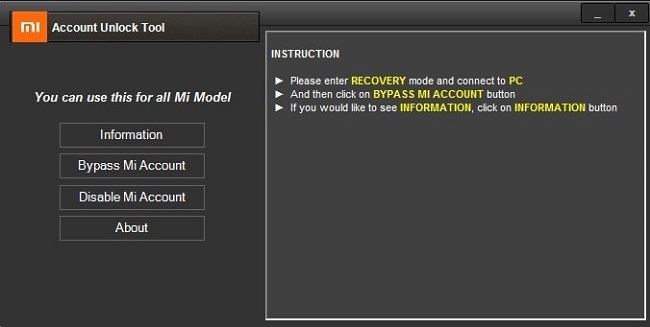 When you click on it, you can start using the Mi account removal tool on your system. Follow the simple steps below to use the open account tool to bypass or remove your Mi cloud account. First, power down your device. Then press and hold power + volume up buttons of your phone. Once your phone shows the Mi logo, let go of the power button but hold on to the volume up button. Your phone will now start showing the PC Suite mode, otherwise known as recovery mode. Now, you can let go of the volume button. Now, you can launch the Mi account unlock tool that you have installed on your PC. On the software, click on the information option. It will show you the device information, and it will confirm that your device has been connected properly. Now, click on the option that says Bypass Mi account. Your device should now restart automatically. Once your phone has booted back up, you can now use it freely, because the Mi account has been bypassed. Alternatively, you can also choose the option that says remove, to remove the Mi account authentication from your phone entirely. I wouldn't recommend that because bypassing is the best way to ensure that your phone will continue to work usually afterward. So, these were some of the things that you needed to know about the Mi account remove tool. Using this tool, you can get your phone that is unusable back to its usual, usable self again. You should be aware of what you are clicking on there because sometimes, the phone might misbehave. If you choose to remove the Mi account authentication from it entirely. Mi cloud authentication is critical and the phone company treats it quite seriously, so be responsible about this. That said, I am sure this tool will be a lifesaver for a whole lot of you out there. Hope you found this post helpful.